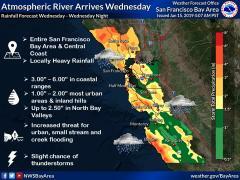 The National Weather Service is warning of an Atmospheric River impacting our area tomorrow afternoon. Expect moderate to heavy rain and high winds beginning at 1:00 pm and continuing through the evening. 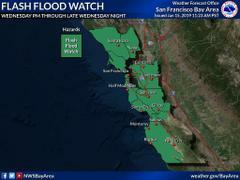 NWS has also issued a flash flood watch from 3:00 pm Wednesday to 3:00 am Thursday morning. 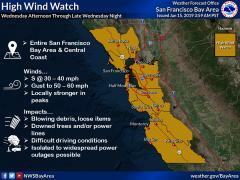 Expect potential power outages and have your cell phones charged and flashlights and batteries on hand. Larkspur at Piper Park, off Doherty Drive. Behind the Police Department, on the east side of the playground. Corte Madera at Central Marin Fire Department Station 14. Tamalpais Ave @ Pixley Ave, rear of Fire Station near the garbage bins. San Anselmo on Sunnyhills Drive, Sunnyhill Dr @ Sir Francis Drake Blvd. on the West side of Redhill Shopping Center, parking lot in front of the Tennis Courts, near the ball field.